There are so many cookbooks out there that I rarely know which ones to trust. Because of the over-abundance of cookbooks, I tend to stick to five or so books that are tried and true. I was recently inspired by the boys at The Bitten Word to go through my food magazines and pick out recipes that I’ve always wanted to try. With post-it notes in hand, I started flagging all of the recipes that peeked my interest, hoping that I would eventually make some of them. Having gone through all of my magazines, I quickly moved on to my cookbooks. Only having five cookbooks however, I quickly ran out of recipes to flag…which got me thinking—“I need some new cookbooks!” But which ones should I buy? There are so many?! That’s where you come in, my friends! I’m starting a list of the very best cookbooks, submitted by you, our readers, and making an ultimate cookbook resource list! Here’s how it works. I’ll start the list off with my favorite 5 cookbooks. Readers will then have the opportunity to submit one cookbook to add to the list. I’ll take submissions for a week or two, and once I’ve gathered all of the submissions, I will re-post the complete list! If you’re a food blogger or have your own website, let me know and I will add a link to your site next to your submission. 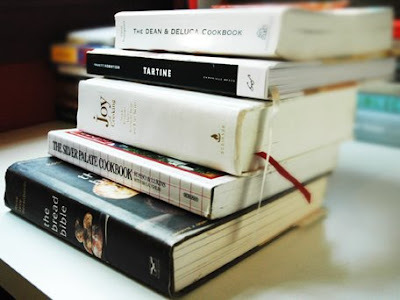 Make sure to pick your very favorite cookbook…one that you’ve tried and are sure others would like! Submissions should be posted in the comments. I’m a cookbook fanatic, so it’s hard to pick only one! But I really like the Whole Foods Market cookbook for recipes and reference. I don’t usually use cookbooks but when I do need one the most dog-eared cookbook on my shelf would be an old Fannie Farmer book, with an equally old Boston Cooking School book coming in second. I can find basic instructions for cooking just about everything in one or the other and then take it from there to do my own thing. Vegetarian Cooking for Everyone by Deborah Madison is the best book I’ve found for cooking vegetables. And I’m not vegetarian. I’m a big fan of Nigel Slater’s Kitchen Diaries – fantastic grub! First, I have to admit that I really can’t follow a cookbook recipe anymore – I just have to inject my own ideas. When i was starting out, though, i learned so much from Dean and DeLuca! It still sits on my shelf, and provides me with inspriration from time to time. I nominate: I’m Just Here for the Food, version 2.0 by Alton Brown. I’ve learned so much about the science of cooking from this book. There is no way I can pick one favorite, but I’ve really been enjoying The Zuni Cafe Cookbook. Can’t wait to see the final list! Great suggestions everyone! Keep ’em coming! I’ve been obsessed for the last couple of months with Jamie at Home by Jamie Oliver. Every recipe I’ve tried has been fantastic! Deborah Madison’s Vegetarian Cooking for Everyone. It’s pretty much my bible. Definately Baking: From my Home to Yours by Dorie Greenspan. I have to go with Nigel Slater’s Appetite – it’s the book that is most covered in food in our kitchen. The spine is cracked, the pages dog-eared. I love it because it gives variations on a recipe and gives you the confidence to try variations of your own. Brilliant book. I’m a cookbook addict, so I’m mostly excited to see the final list!! If I had to chose one, I’d choose The Bread Baker’s Apprentice by Peter Reinhart, but I see that you already have one bread cookbook. It’s really hard to choose just one though! It’s so hard to pick just one! I’ll go with Donna Hay Flavors. It offers a lot of variety, great photos, and simple recipes. i second marcella’s classic “the essentials of classic italian cooking”. i currently enjoy learning from The Great Book of French Cuisine: Revised Edition by Henri-Paul Pellaprat and Jeremiah Tower. i am looking for a similar book on spanish cooking, i haven’t found one i like. My nomination is the Cake Bible by Rose Levy Beranbaum. Baking Illustrated: A Best Recipe Classic by The Editors of Cooking Illustrated Magazine. I love both of them and use them often. I grew up with Betty Crocker and moved on to the The French Laundry. I nominate Jamie’s Italy by Jamie Oliver… excellent easy to follow recipe’s. In the Kennedy Kitchen: Recipes and Recollections of a Great American Family by Neil Connolly. I nominate The Essentials of Classic Italian Cooking by Marcella Hazan. Reliable and everything always turns out so well. My nomination: How to Cook Everything by Mark Bittman. The name says it all. It’s endlessly useful and I often myself turning to it for basic pointers on dealing with all kinds of meats and vegetables. If you love Latina cooking, you will love this book. It has recipes from Cuba, Puerto Rico, Argentina, Columbia. Every one is delicious. Fast Food My Way by Jacques Pepin is a beautiful and practical cookbook, full of simple recipes that you will actually make. Love it! Thanks Kirsten! I’ll those to the list. I would like to add Veganomicon by Isa Moskowitz and Terry Romero. That is truly a bible for most vegan cooks, including me.